A fantastically brilliant—and green—idea! Improving the energy efficiency in your home by utilizing the earth’s temperature. 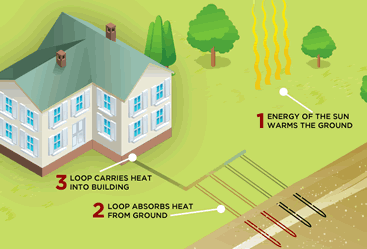 A geothermal system is a central heating and/or cooling system that transfers heat to or from the ground. Geothermal works because the ground beneath our feet is warmer than the outside air in the winter and cooler in the summer. 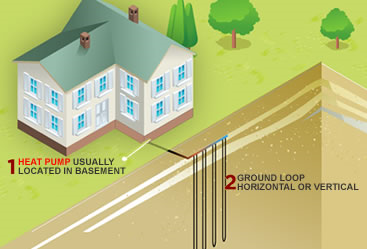 Inserting a series of small pipes into the ground allows heat to be transferred to and from your home. In this process heat is not created, it is transported therefore no fuel is burned. In order to do this they use heat pumps. These heat pumps have the capability to transfer heat from a cool space to a warm space, against the natural direction of flow. Geothermal systems can also enhance the natural flow of heat from a warm area to a cool one. This design takes advantage of the moderate temperatures in the ground to boost efficiency and reduce the operational costs of heating and cooling systems. Geothermal systems are environmentally friendly and do not use fossil fuels such as natural gas and propane. Threats caused by combustion are eliminated. No worries about flames, fumes, odors, or carbon monoxide. Geothermal units tend to be quiet and there is no unsightly outdoor unit. They also guarantee improved comfort because they heat and cool your home evenly as well as dehumidifies the air during the hot summer months. Interested in purchasing a Geothermal system or need more information? Call the experts at Bay Area Mechanical 410-636-6400!